This tall perennial puts on a beautiful show with its spike of purple to pink blooms all summer. It is not common in Washington but is fairly common in the native plant nursery trade. 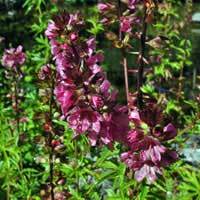 Works well in the moist to wet garden or blended with other perennials that need supplemental watering. Suitable in fresh water and saltwater shoreline areas.